Father in heaven, by whose grace the virgin mother of thine incarnate Son was blessed in bearing him, but still more blessed in keeping thy word: Grant us who honor the exaltation of her lowliness to follow the example of her devotion to thy will; through the same Jesus Christ our Lord, who liveth and reigneth with thee and the Holy Spirit, one God, for ever and ever. Amen. Father in heaven, by whose grace the virgin mother of your incarnate Son was blessed in bearing him, but still more blessed in keeping your word: Grant us who honor the exaltation of her lowliness to follow the example of her devotion to your will; through Jesus Christ our Lord, who lives and reigns with you and the Holy Spirit, one God, for ever and ever. Amen. Lessons revised in Lesser Feasts & Fasts 2018. After the angel Gabriel had announced to Mary that she was to become the mother of Our Lord, Mary went from Galilee to Judea to visit her kinswoman Elizabeth, soon to be the mother of John the Baptist. This visit is recorded in Luke 1:39-56. 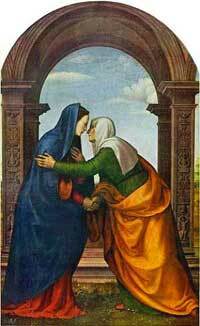 Elizabeth greeted Mary with the words, "Blessed are you among women, and blessed is the fruit of your womb." Mary burst forth with the song of praise which we call the Magnificat, beginning, "My soul proclaims the greatness of the Lord." We are told that even John the Baptist, still unborn, leaped for joy in his mother's womb. Thus we are shown, side by side, the two women, one seemingly too old to have a child, but destined to bear the last prophet of the Old Covenant, of the age that was passing away; and the other woman, seemingly not ready to have a child, but destined to bear the One Who was Himself the beginning of the New Covenant, the age that would not pass away. It is this meeting that we celebrate today.